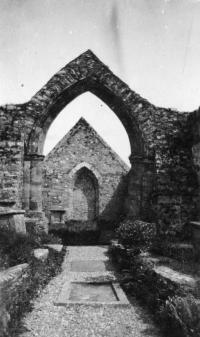 A view of the interior of Ardmore Catheral. Carvings on the gable end of Ardmore Cathedral. A number of the upper panels are blank, but included in the remaining panels is a depiction of the Archangel Michael weighing the souls. Included in the lower panels are Adam and Eve, the Adoration of the Magi, and the Judgement of Solomon. A view of the interior of Ardmore Cathedral. A man and a boy with a net fishing on the coast of Ardmore. Two unidentified fishermen in a boat along the coast of Ardmore. A view of Ardmore Village and the surrounding area. To the right of the photograph Ardmore Pier is under construction. A view of the Boat Cove, Ardmore at low tide with Ardmore Village in the background. A view of Ram Head, Ardmore. A group of fishermen fishing for sprats on the coast of Ardmore. An unidentified fisherman in a boat off the coast of Ardmore. In the background Ardmore Pier under construction. A distant view of the Cliff, Ardmore Village. Ardmore beach is in the foreground with a man on a bicycle. A view of the rear facade of Ardmore House. A distant view of Ardmore Village with Ardmore House (right) in the background. Note the wooden (right) structure in the water and the drying fishing nets draped over the coastal wall. A view Saint Declan’s Church, Ardmore. In the background is Ardmore Village. To the left of the picture is Saint Declans Well. The pathway the person is walking on is known as the ’Cliff Walk’.